Not to be confused with Pengoon. 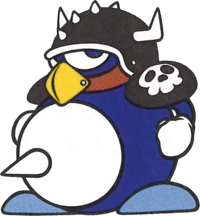 Penkoons are bulky soldiers that patrol areas in Wario Land: Super Mario Land 3. When Wario comes too close to them, they make the spiked ball in their stomachs pop out. Despite their horned helmets, Wario can harm them by jumping on them; however, due to the spikes on their stomach, they cannot be harmed by charging head on by the Body Slam. Pokopen Derived from the sound a tanuki of myth makes and a penguin. ↑ 1.0 1.1 "This pirate is part penguin and part racoon. [sic] Watch out for its spiked stomach ball." - Wario Land: Super Mario Land 3 English instruction booklet, page 19. ↑ 2.0 2.1 「タヌキ？ペンギン？謎の海賊兵。お腹のトゲ付きボールを蹴って攻撃してくる。」 (Tanuki? Penguin? A mystery among pirate men. It attacks by kicking a spiked ball from its stomach.) - Super Mario Land 3: Wario Land Japanese instruction booklet, page 20. This page was last edited on April 24, 2019, at 13:04.